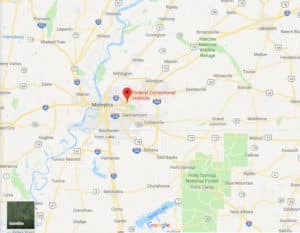 Facilities: FCI Memphis with an adjacent minimum security satellite prison camp and a detention center. Location: FCI Memphis is located in the northeast section of Memphis, Tennessee. Background: FCI Memphis was opened in 1977. In addition to housing medium security federal prisoners, FCI Memphis also contains a unit designated for the housing of pre-trial and pre-sentence federal detainees. In 2012, a joint investigation conducted by the FBI, the Bureau of Prisons, and the Department of Justice Inspector General exposed a drug distribution ring run by several inmates with the assistance of corrupt prison staff members. Housing: Inmates are housed in two-person cells within the five housing units. In the camp there are dormitories of two-and four-person cubicles within the four housing units. Health Services: FCI Memphis Health Services Department offers a wide variety of services and is staffed by physicians, mid-level practitioners, nurses, pharmacists, dentists, and administrative staff. All inmates are assigned a primary care provider (PCP) and may not change PCPs. Health services include an initial screening, sick call, periodic health examinations, eyeglasses, dental services, medications, emergency medical services, and diagnosis and treatment of chronic infectious diseases. Psychology Services: Every inmate at FCI Memphis must complete a Psychology Services Inmate Questionnaire within 14 days of his arrival. Inmates who are having major psychological symptoms such as depression or anxiety, as well as those with significant interpersonal difficulties, are encouraged to seek services. Available services to inmates include individual counseling and crisis intervention, simple advice concerning personal issues, psychological testing (only by proper referral), and specialty groups such as anger management and stress management. Residential Drug Abuse Program (RDAP): FCI Memphis houses a Residential Drug Abuse Program (RDAP). It also offers Alcoholics Anonymous (AA), Narcotics Anonymous (NA), a Drug Education class, and the Non-Residential Drug Abuse Program (NR-DAP). The camp screens inmates for the Residential Drug Abuse Program (RDAP), but the camp does not house a RDAP facility. Education Services: FCI Memphis offers literacy, Pre-GED, GED, Spanish GED, English-as-a-Second Language (ESL), and parenting programs to inmates. Career counseling, educational advisement, Adult Continuing Education (ACE) courses, and a Pre-Release Program are also available to inmates. High school diplomas and post-secondary programs are available through paid correspondence programs. Advanced Occupational Education: Both facilities offer advanced occupational education in Logistics/Transportation Management and Quality Assurance and Supervision. FCI Memphis also offers occupational education in Building Trades. Vocational Training: FCI Memphis does not offer any vocational training. Apprenticeship: Both facilities offer apprenticeships in Career Development Technician, Carpenter (Maintenance), Cook (Hotel and Restaurant), Dental Assistant, Electrician, HVAC, Landscape Gardener, and Teacher Aide. The main facility offers apprenticeships in Drafter (Architectural), Electronics Tester, Machinist, Maintenance Electrician, Painter, Plumber, Purchasing Agent, and Quality Control Technician. The camp offers apprenticeships in Engraver, Golf Course Management,Printer-Slotter and Operator, and Welder (Combination). Library Services: A leisure and law library are available to FCI Memphis inmates. An Interlibrary Loan Program associated with the Memphis/Shelby County Library is also available. In the leisure library inmates can check out books, magazines, and newspapers. In the law library inmates can use the TRULINCS Electronic Law Library, a copy machine, and typewriters. UNICOR: FCI Memphis houses a UNICOR factory producing and servicing electronic cable assemblies and a printing operation. Commissary: Inmates may withdraw money for reasons of personal spending in the institution’s commissary, for family support, or other approved purposes. Inmates are permitted to spend up to $360.00 per month on items such as shoes, food, drinks, clothing, electronics, and other items. Recreation: The recreation program includes intramural sports where inmates can participate in softball, basketball, soccer, volleyball, and flag football. The Wellness Program offers instruction on various health/fitness topics. Activities available include structured classes, exercise programs and fitness clubs. Participants can receive certificates for program completion. A variety of activities are available on the recreation yard, softball field, and in the gymnasium for “off-duty” inmates, including bocce ball, volleyball, handball, racquetball, basketball, soccer, shuffleboard, horseshoes, stationary bike program and football. There is a jogging/walking track which is approximately 1/3 mile in length and an activity room available for ping pong. Recreation also offers a music room for individual practice and for use by groups. The Hobby Craft Program provides tools, a work room and instruction in various crafts including leather craft, woodworking, painting, and beading.